Bormioli Rocco Galassia Tumbler Beverage Glasses, Set of 6, New, Free Shipping. Condition is New. Shipped with USPS Priority Mail. · Capacity: 6 1/2 oz. · Made in Italy. · Dishwasher Safe. It is the new owners' responsibility to clean. 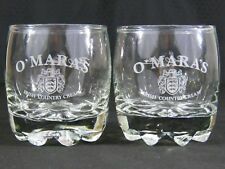 This is a pair of never used Galassia rocks glasses from an O'Mara's gift set. When we find old treasures, we do our best to find the history behind them. These are also seen on the checkout page. Photos may be needed to process a claim. Beautiful set of 6 14 ounce glasses that are Dishwasher safe and made in Italy. These will always be in style with their classic look. Quality made glassware. Perfect for any occasion. Feel free to share my site with others. Bormioli Rocco Galassia Highball, Beverage Glasses (Set of 4) 13.75oz each. This is a set of 4 highball glasses, each with a 13.75 ounce capacity. Versatile enough for any cold beverage. 13.75 oz | 41 cl. The Bormioli Rocco Galassia 16-piece Glassware Gift Set (8) Rocks Whiskey and (8) Beverage glass tumblers. Serve your guest anything from water to cocktails with this 16 piece set of Galassia tumbler glasses. This 10 ounce rocks glass by Bormioli Rocco features the bumpy, ridged base of the Galassia line, which is also designed for practical nesting to save you space. Model #: 4919Q103 Tempered Dishwasher Safe Lead Free Top Diameter: 2.88" Bottom Diameter: 3.25" Shipping weight: 20 lbs. Set of 6 - Bormioli Rocco Shot Glasses, Galassia Pattern, Italy 2 oz. · Shot glasses or can be used as saki glasses. I Includes original box. Bormioli Rocco Galassia Rocks Glasses (Set of 4) 10 oz each - FSTSHP. Shipped with USPS Priority Mail. This 14 ounce glass by Bormioli Rocco features the bumpy, ridged base of the Galassia line, which is also designed for practical nesting to save you space. Model #: 4919Q102 Tempered Dishwasher Safe Lead Free Top Diameter: 2.63" Bottom Diameter: 2.5" Shipping weight: 21 lbs. With stemware, glasses, food storage and preserving jars, and dinnerware gracing tables around the world, quality is the cornerstone in the foundation that supports the Bormioli Rocco reputation. Thick and durable glass sits perfectly in the hand. THE ELEGANT GALASSIA SHOT GLASSES: The Galassia series of the Bormioli Rocco unique collection includes 3 beautiful short shot glasses with a sturdy heavy sham. These tequila shot glasses are ideal for bars, restaurants, pubs, parties and house gatherings. Pattern: GALASSIA. Manufacturer: Bormioli Rocco. Piece: On The Rocks Glass. China - Dinnerware Crystal & Glassware Silver & Flatware Collectibles. Canadian and international orders. U.S. Expedited. Set of 7 Bormioli Rocco Galassia Rocks glasses that hold 10 oz. They stand about 3 1/2" tall with an opening of 3" across the top. This set has Italy stamped on the bottom of each glass. Excellent pre-owned condition. Pattern: GALASSIA. Manufacturer: Bormioli Rocco. Piece: 14 Oz Tumbler. Helpful Links. Canadian and international orders. U.S. Expedited. Pattern: Galassia. Bormioli Rocco. Maker: Bormioli Rocco. Piece Type: 2 oz. Shot Glass. Marked: Italy on bottom. We strive to bring you the finest in Antiques, Collecibles, Fine Art, Minerals and Craft Supplies. Beautiful Set of 5 Bormioli Rocco Galassia Coppa Sundae Dessert Bowls (2-3/8” x 3-7/8”D). In Great Condition!!! Please View All Photos!!! Email Questions!!! Thank you for looking!!!! Set of 6 - Bormioli Rocco Shot Glasses, 2 oz., Galassia Pattern.